One of the first software programs that gets installed on many computer systems is the excellent Unlocker program. Unlocker integrates itself into the Windows right-click context menu. It can be used to unlock files and folders that are locked by the operating system or a process. Messages like "Cannot delete file: It is being used by another person or program" can be countered with Unlocker. File And Folder Unlocker is basically a similar application. It does however work in a different way.The software can be started manually by double-clicking its program file. It does integrate itself into the right-click menu as well but behaves differently than Unlocker does. The portable software will list all running processes on the computer system and a search box that can be used to search for specific processes, files or folders. The search box will be automatically filled with information if the software has been integrated into the right-click menu. An alternative to listing open objects is to double-click any process to list all of its open objects in the second box in the interface. All objects will be listed including their location on the computer system, their owner and handle / offset. File And Folder Unlocker is definitely not as handy as using Unlocker when it comes to specific files or folders that are locked by the computer system. It does however provide extensive information that Unlocker does not provide. This can be useful to analyze the current situation in depth. Might for example be useful if a file, process or folder is locked every time the system is shutdown. This program can help the user find out why it is locked while Unlocker would only be able to unlock it so that the computer system could be shutdown. 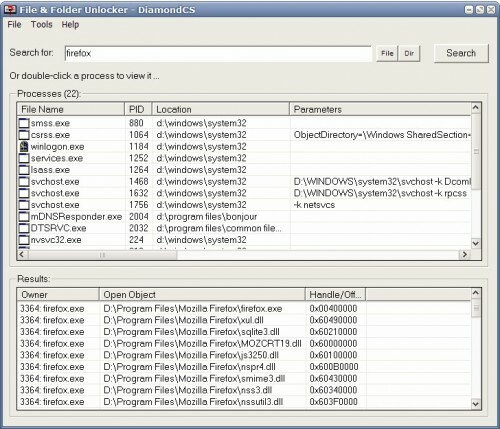 The list of open objects can be exported for further analysis. File And Folder Unlocker is a 36 Kilobyte freeware that is compatible with Windows 2000 and Windows XP. This utility is pretty useful sometimes. I’ve tried and like it. How can I remove the right-click integration of this program. It’s really annoying.